Neuropeptides serve many important roles in communication between cells and are an attractive target for drug discovery. 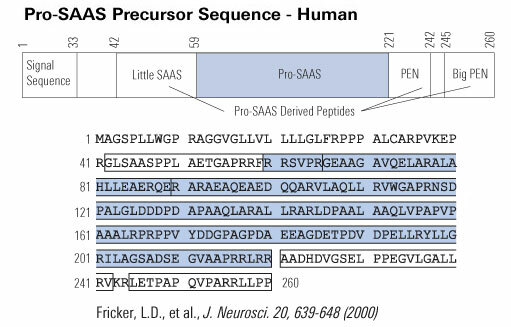 Neuropeptides are produced from precursor proteins by selective cleavages at specifi c sites, and are then broken down by further cleavages. In general, the biosynthetic cleavages occur within the cell and the degradative cleavages occur postsecretion, although there are exceptions where intracellular processing leads to inactivation, or extracellular processing leads to activation of a particular neuropeptide. A relatively small number of peptidases are responsible for processing the majority of neuropeptides, both inside and outside of the cell. Thus, inhibition of any one enzyme will lead to a broad effect on several different neuropeptides and this makes it unlikely that such inhibitors would be useful therapeutics. 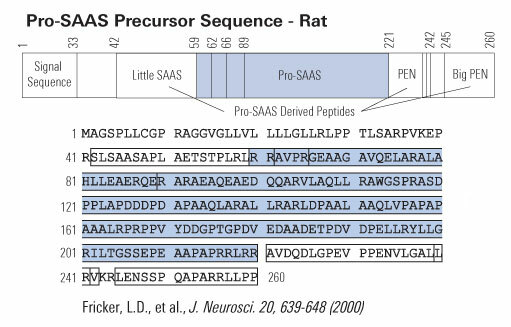 However, studies with mutant animals that lack functional peptide-processing enzymes have facilitated the discovery of novel neuropeptides, many of which may be appropriate targets for therapeutics. Fricker LD. Neuropeptide-processing enzymes: applications for drug discovery. AAPS J. 2005;7(2):E449-55. Human obesity has an inherited component, but in contrast to rodent obesity, precise genetic defects have yet to be defined. A mutation of carboxypeptidase E (CPE), an enzyme active in the processing and sorting of prohormones, causes obesity in the fat/fat mouse. We have previously described a women with extreme childhood obesity (Fig. 1), abnormal glucose homeostasis, hypogonadotrophic hypogonadism, hypocortisolism and elevated plasma proinsulin and pro-opiomelanocortin (POMC) concentrations but a very low insulin level, suggestive of a defective prohormone processing by the endopeptidase, prohormone convertase 1 (PC1; ref. 4). We now report this proband to be a compound heterozygote for mutations in PC1. Gly-->Arg483 prevents processing of proPC1 and leads to its retention in the endoplasmic reticulum (ER). A-->C+4 of the intro-5 donor splice site causes skipping of exon 5 leading to loss of 26 residues, a frameshift and creation of a premature stop codon within the catalytic domain. PC1 acts proximally to CPE in the pathway of post-translational processing of prohormones and neuropeptides. In view of the similarity between the proband and the fat/fat mouse phenotype, we infer that molecular defects in prohormone conversion may represent a generic mechanism for obesity, common to humans and rodents. Jackson RS, Creemers JW, Ohagi S, et al. Obesity and impaired prohormone processing associated with mutations in the human prohormone convertase 1 gene. Nat Genet. 1997;16(3):303-6.